St David’s Day falls on the first day of March, as this is believed to be the date St David died in 601, and is a national day of celebration within Wales since the 18th Century. Although St David’s Day is not an official national holiday, it is celebrated by Welsh societies around the world. St David was the patron saint of Wales and doves. He was born to Sant, a Prince of Cardigan and St Non, the daughter of a chieftain, in Caerfai, Pembrokeshire. Before going on pilgrimages to Cornwall, Wales, Ireland and Jerusalem, where he was made an archbishop, St David studied under St Paulinus in Cardigan. During his lifetime he helped to spread the word of Christianity and also founded around 12 monasteries. These monasteries were known for the extreme asceticism. Monks would live on a diet of bread, vegetables, water and milk. They also did all hard labour themselves, this included farming without the aid of an ox to plough the fields. 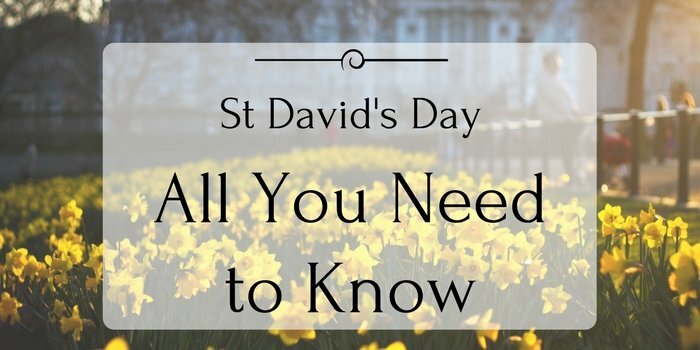 St David has been the patron saint of Wales since the 12th Century, after he was canonised by Pope Callixtus in 1120. St David, along with St Patrick are the only two patron saints of the British Isles to be patron saints of the country they have visited. There are numerous events held all around Wales on St David’s day. Towns all across Wales celebrate the event with meetings, parades, concerts and much more. Cardiff holds the National St David’s Day Parade, which takes place across the centre of the City. The parade finishes outside St David’s Hall with a rendition of the national anthem, Hen Wlad Fy Nhadau. Many castles and heritage sites will have free admission on St David’s Day. Many streets surrounding St David’s Bishop’s Palace hold mini-festivals in honour of St David. The annual Pilgrim’s Walk leads to the illumination of the St David’s Day Stone and ends at the Oriel y Parc, here you can take a look around a traditional Welsh market or listen to live bands. Many schools, especially primary schools, will hold their own traditions and events. A lot of children will dress up in traditional Welsh clothing, although in recent years Welsh rugby shirts were favoured over the traditional clothing. There are plenty of activities that you can take part in across Wales this St David’s Day, from concerts to parades and markets. In Cardiff you will be able to attend a service at the Norwegian Church for musical celebrations. This event has been organised by Age Cymru and is in aid of their Big Welsh month campaign where money will be used to support vulnerable older people throughout Wales. The service will begin at 7pm with tickets costing £10. Also in Cardiff is the BBC National Orchestra of Wales and the National Chorus, where they will be joined by Welsh soprano Rebecca Evans at St David’s Hall. With them will be tenor Joshua Mills, and 2016 BBC Young Musician string finalist, Charlie Lovell-Jones. The National Museum Cardiff is hosting live music in the main hall, starting from 12pm. You can enjoy some live music along with a 200 million-year-old dinosaur, which was discovered on a beach near Penarth.